LIPANO aims at a sustainable agricultural use of Brassicaceae-dominated producing areas for the subsequent cultivation of different crops, especially legumes. LIPANO also includes analyses of allelopathic plant-plant and plant-microbe interactions. Glucosinolates (GSLs) are a class of secondary metabolites with allelochemical properties found in members of the Brassicales. GSLs are relatively nontoxic, but after hydrolysis of the sugar moiety by myrosinase (thioglucosidase), the compounds are degraded. The break-down products are highly bioactive, affect germination, growth of neighboring plants and can have antimicrobial effects. Therefore, the GSL/myrosinase complex is a natural plant defense system against diverse pathogens, which has already been used in integrated pest and weed management. Presently, potential negative long-term effects of the GSL hydrolysis products on beneficial soil microorganisms are not known. Bioassays performed in this study are based on analyzing growth suppression of selected pathogenic and beneficial soil fungi by GSLs and their hydrolysis products. Lipid, protein, enzyme and RNA analyses were carried out to systematically characterize GSL derived changes of the soil community structure. On this end, soil of a selected test site (organic farming) was analyzed after exposure to GSLs utilizing mass spectrometry and gas chromatography to provide lipid fingerprints. Signature lipid biomarker (SLB) analysis used in determining changes in community structure of soil microorganisms revealed significant changes after exposure to GSLs. A time-dependent shift in microbial community structure, and significantly decreased levels of fungal biomass after 4 weeks of incubation was detected. These changes in SLBs are attended by a significant increase in lipase and protease activity, which may indicate death of organisms or an enrichment of species releasing those enzymes when exposed to GSLs. Information obtained by 16S metagenomic analyses from soil samples exposed to a 4-week-GSLs application revealed a tremendous reduction of fungal and bacterial diversity in comparison to the control. This shift was accompanied by a massive reduction in biological diversity concerning bacteria and especially fungi. After 4 weeks of incubation, one specific yeast accounted for over 98% of the total fungal biomass found in the test soil. Similar results were obtained concerning the bacterial community. Specific bacteria, which were found to be associated to the root microbiota of Brassicaceae, became more abundant, while in general the biological diversity decreased profoundly during incubation. Furthermore, germination and growth of Lotus japonicus and Pisum sativum belonging to the Fabales, were drastically impaired after exposure to GSLs. 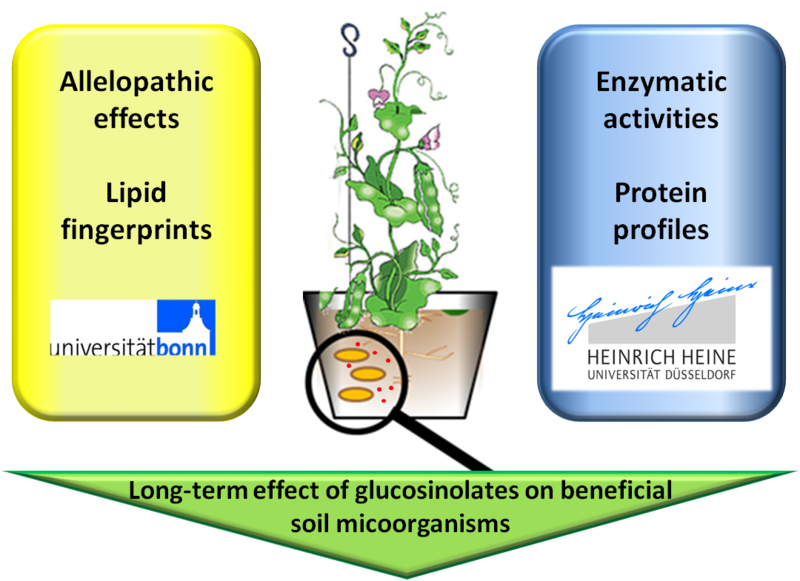 The LIPANO project thus revealed unprecedented negative effects of GSLs on the soil microbial biodiversity as well as on the germination and growth of legumes. Total budget of LIPANO: € 149.998 (NRW-Strategieprojekt BioSC funded by the Ministry of Innovation, Science and Research of the German State of North Rhine-Westphalia). Domrose, A, Klein, AS, Hage-Hulsmann, J, Thies, S, Svensson, V, Classen, T, Pietruszka, J, Jaeger, KE, Drepper, T and Loeschcke, A (2015). Efficient recombinant production of prodigiosin in pseudomonas putida. Front Microbiol 6: 972. Loeschcke, A and Thies, S (2015). Pseudomonas putida-a versatile host for the production of natural products. Appl Microbiol Biotechnol 99(15): 6197-6214.